It has a dimension of 80 mm x 80 mm. The strange shape is because a had a case in mind. Therefore, I had to align the batteries this way because there are studs in the corners. The board is populated with ready-made modules which take a lot of space. The light sensor module was even bigger, so I had to cut it brutally with my pliers into shape. Beneath the Wemos D1 module, there resides a ATTiny85 for the PIR sensor interaction. The PIR sensor is connected via cable, so I can interchange it. It turns out that the PIR sensor is very sensitive to voltage variations on the power rail. 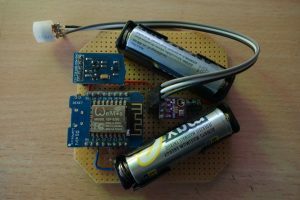 Every time the ESP connected to the network, the PIR sensor was triggered. Finally I was able to get rid of it with a bigger capacitor on the ESP power input and a 33 pF capacitor directly on the pins of the PIR sensor for fast spikes.